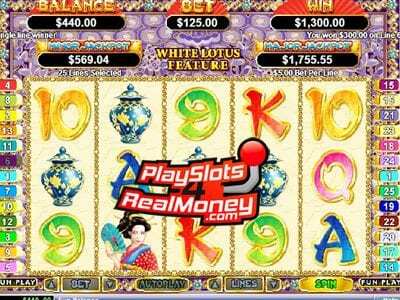 Golden Lotus is a five reel, twenty-five pay line Chinese / Asian-themed video slot machine that is powered by Realtime Gaming (RTG) software. It is similar to Happy Golden Ox of Happiness but has a much different feel to it. Golden Lotus is a newer game than the Happy Golden Ox of Happiness and has better graphics plus bigger wins in our opinion. This game features two progressive jackpots to win plus multipliers; scatter wins, two different free spins features, a wild substitute symbol, and a bonus game. Residents of the United States of America, Canada and gamblers all over the planet can play the Golden Lotus Real-Series Asian-themed video slot machine for real money at any of our recommended sites listed on the right-hand side. Click on our banners and our links ensure that you claim your free spins, and you are USA slots sign up bonuses when you are ready to make a casino deposit. Before you click the “Spin” or “Auto Play” button you have to select the amount of money you want to “Golden Lotus” online slots real money. The coin denominations start at a penny per payline and go up to $0.01, $0.02, $0.03, $0.04, $0.05, $0.06, $0.07, $0.08, $0.09, $0.10, $0.25, $0.50, $1, $2.50 and five dollars per payline. How Do I Win The Progressive Slots Jackpot? 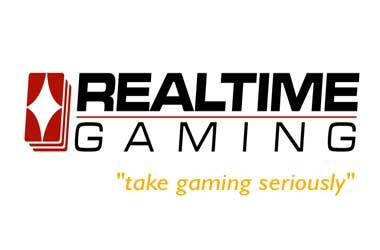 American gamblers that like Asian / Chinese themed video slots feel that this is one of the best online slots because of huge fixed and two progressive jackpots. The minor and the major are ultimately trigger at random. There is not winning combinations that will trigger the minor or the major jackpot. When you land five of the Golden Lotus icons, you will win the 8,888 fixed coin top fixed jackpot. There are many other Chinese / Asian themed icons on the reels when spinning the Golden Lotus reels besides the Green and the White Lotus symbols. However the Green Lotus is the wild, and the White Lotus is the scatter. The lotus flower is very important in Asian culture. In the Golden Lotus, you will find some traditional poker playing cards plus many other icons. For example, you will see Geisha Girls wandering around the garden, Chinese lanterns, priceless jade green dragons, and Ming vases. These are the higher paying symbols, which can bring you wins up to 8,888 coins. The betting starts with one penny per spins, which allows all players to hunt for the luckiest flower in China. Obviously, the luckiest flower in China is the Golden Lotus. You can enjoy this game on your computer, Smartphone or tablet. In the background of this online slot machine by Realtime Gaming, you will see a beautiful well-kept Chinese Garden. In the garden, you will see wonderful flowers, huge over-hanging trees, an extravagant sunset with a gorgeous Pergola. All of these graphics fit on a 5X3 grid! The Golden Lotus symbol is the highest paying icon in the game. Score five of them in a row and win the 8,888 fixed coin jackpot. After that, the next highest paying symbols are the Geisha Girls. Win 1,250 as a result of landing five Geisha Girls together on the reels. Also, the Chinese lanterns, Ming vases, and priceless jade green dragons will score you some nice wins. Last Updated March 9, 2019, By Jack Gold Of PlaySlots4RealMoney.com.